Halloween Costumes: We've Gone Foodie Crazy! The Autumnal season has rolled around, and with it comes our favorite occasion for dress up: All Hallow's Eve! 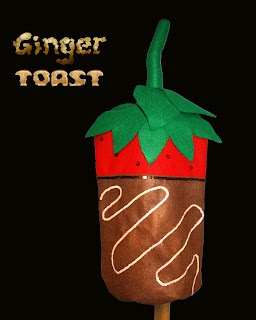 This year, Fiddlesticks is quite excited to be carrying Halloween costumes by Ginger Toast, designed by our very own Caitlin Crandall. We interviewed her about the inspiration behind her collection, as well as her general love for Halloween (if you've been to the shop, why yes, she IS the one with the Halloween tattoo!). Hi Caitlin! Tell us a little bit about your relationship to Halloween. I love everything about the season- the pumpkins, the weather, the food... the pumpkins. As a child, I grew my own pumpkin patch, and hosted some amazing Halloween parties, and as soon as Halloween was over, I would begin my preparations for the following year. My parents would often find me in front of the mirror dressing up and creating elaborate makeup looks. Why is your first collection of Halloween costumes food-themed? I love San Francisco and San Francisco loves food. Living in a city that values the content and artistry of the culinary world was the inspiration for this collection. We pass our fascination with food to the children of our city and I had the thought that children love to play with food--why not also play AS food? Plus it makes me chuckle to think of a kid dressed as a Soft Shell Crab Hand Roll. What sets these apart from other children’s Halloween costumes? As someone who grew up making my own Halloween costumes every year, I miss the element of the handmade in today’s store-bought options. I wanted to offer an alternative to the mass produced styles that inundate the market today. And rather than doing a homemade spin on the usual fare, for my first collection, I wanted to do something that you couldn’t find anywhere else. 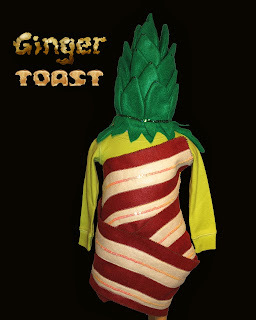 I have seen a handful of bacon costumes, but Bacon Wrapped Asparagus? Chances are you won’t see too many of those on Halloween! What does the future hold for Ginger Toast? Costumes! I plan to expand my line each year by adding new, specialized collections. There are already a couple of themes taking shape. I suppose that means the difference between me as a child and me now is that I’m not waiting until after Halloween to plan next year's costumes! I am throwing around a couple of ideas, but for the first time I’m not sure. I have poured so much time and love into this project that I haven’t started my own costume yet (something I usually start months in advance). I am considering being Lumpy Space Princess from the cartoon Adventure Time, or a 1906 San Francisco Ghost, or I might carve a Jack O' Lantern face into my pumpkin costume from a couple of years ago. Did I mention I love pumpkins? Have we whet your appetite? Here's what's on the costume menu. All dishes are made by hand with love in San Francisco, and are for sale in the shop. Crisp slivers of cucumber, sequin-crusted crab claw and succulent crab legs, wrapped in soft white rice and sparkling nori. Yellow corn tortilla stuffed with lettuce, beans, and cubed tomato, topped with a swirling sour cream hat sprinkled with diced chives. For the more adventurous foodie who is not afraid to have the tables turned.